A Cool Heraldic On-Line "Booklet"
Wearable Heraldry ... It’s Everywhere! The site, King’s Chapel and the King’s Chapel Burying Ground, was a two-fer. There are, both in the burying ground outside and within the Chapel itself, coats of arms which can also be found in the Gore roll. Inside, there are several coats of arms which were once placed on the tombs of folks in what is now effectively the basement of the Chapel. They were moved upstairs into the Chapel itself after laws were passed against mixing the dead with the living (for fear of disease, I presume), and the tombs were bricked up. And outside in the burying ground is the table tomb of two of my ancestors, John and Mary (Chilton) Winslow, which also has a plaque of the Winslow arms on it, which arms also appear in the Gore roll. 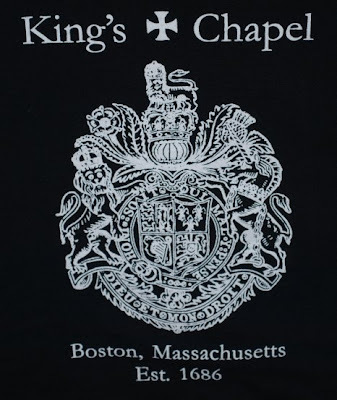 The shirt, of course, gives some basic information about the Chapel, and bears the arms of the Hanoverian kings of England.